Filmmaker Isaac Solotaroff on Wham! Bam! Islam! Director Isaac Solotaroff talks about using Wham! Bam! Islam! and the recently released Hunt For the Noor Stone Interactive game to promote cultural understanding. 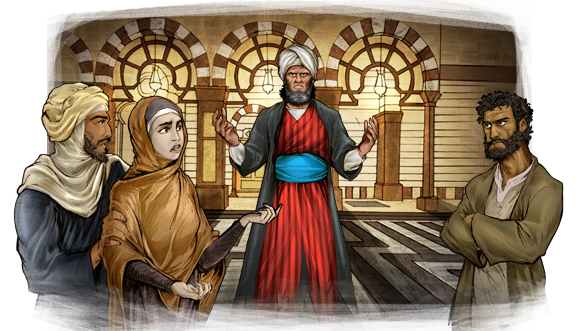 The interactive game, Hunt for the Noor Stone, just launched and features an in-depth, standards-aligned study guide for middle school students. The inspiration for the game came from THE 99, the comic book series featured in Solotaroff&apos;s documentary Wham! Bam! Islam! which aired on Independent Lens last week, and is currently streaming for free on PBS.org. BTB caught up with Soloratoff last week to ask — why a game, and why now? Who are you and what do you do? My name is Isaac Solotaroff and on my good days I get to work on documentaries and on my bad days I try to figure out how to raise money to make documentaries. How long have you been working in documentary film and what inspires you as a filmmaker. Also, what did you do before making films? I have been working as an editor and director since 1999. Before this I was a high school history teacher in a town outside of Oakland, CA. The thing I loved most was my students. The next thing I loved the most was creating and executing lesson plans that allowed me to reach into the dry text books we were using and create narratives that somehow applied to the lives of my students. At the end of my first year, we were doing a section on the Reagan administration and I had my students watch excerpts from Hoop Dreams. It stimulated the most incredible classroom conversation we had all year — I get goose bumps just thinking about it. That was the moment I decided I wanted to make documentaries. How did you come up with the idea for Wham! Bam! Islam! and why do you think the story of Dr. Naif Al-Mutawa&apos;s quest to create new heroes for Muslim youth around the world is an important story to tell on public television? I met Naif through family friends in the summer of 2006. He was just finishing raising his first round of capital for THE 99. I had been looking for a project to do in the Middle East and I was fascinated by the social experiment that Naif was embarking on. I had just finished reading a couple of excellent books about contemporary Muslim societies and was thinking a lot about some of the internal fault lines in that part of the world beginning with this struggle between fundamentalists who wanted to anchor their culture to religious traditions that date back 1,200 years and modernists who wanted to create a more secular society that could integrate into the 21st century. Obviously, Naif in creating new heroes and story lines for Muslim children in an American-styled comic book, was very publicly advocating for a more inclusive social approach to educating and entertaining kids. I was intrigued to see where this journey was going to take him. We like to see producers working directly with local stations and reaching local communities in innovative ways. With Wham! Bam! Islam! you’ve ventured into gaming, and educational video modules and lesson plans. What made you take this approach? My inspiration to make documentaries started in a classroom with 35 high school students! I am thrilled at any opportunity to leverage the stories I am able to capture to create new approaches to reaching young people. I also had such a blast working with my incredible animation team led by Reno Msad and Rene Avalos and I thought it would be very cool to find another way to apply their talents to expand the reach of the film. What’s the next big thing for you, Dr. Naif Al-Mutawa and THE 99? For Naif and THE 99 its the launch of THE 99 animation series on Cartoon Network in Australia and Asia beginning this January. Unfortunately, it seems that Naif has hit a road block getting the animation broadcast in the United States because some extreme voices in the media have made some uninformed attacks on THE 99 which has led the broadcasters to get cold feet. I am continuing to document this and look forward to being able to update the film later this year. In addition I just finished producing a documentary called Pelotero — which — and I hate to make the comparison — is like Hoop Dreams but about two young Dominican baseball players with dreams of making it to the Big Leagues. Dogs or cats? I live in a 500-square foot apartment in Manhattan so the answer has to be cats. My cat Bodie is actually sleeping next to my keyboard right now. I named her after my favorite character in The Wire. Elmo or Grover? My heart says Grover but my nephew says Elmo! Elmo! Elmo! I&apos;m currently listening to... I&apos;m listening to a Spotify shuffle...at the moment its J Dilla — legendary hip-hop producer..
I&apos;m currently watching... The MLB playoffs — Go Tigers! Most overused phrase: Its a toss up between "class warfare" and "clash of civilizations"
Visit iTunes and own a copy of Wham! Bam! Islam!